Back in September of last year, I showed this chart outlining that corporate profits as a percent of GDP were approaching a three-standard deviation event. Since that time, the relationships has gotten even more extended hitting an all-time high. 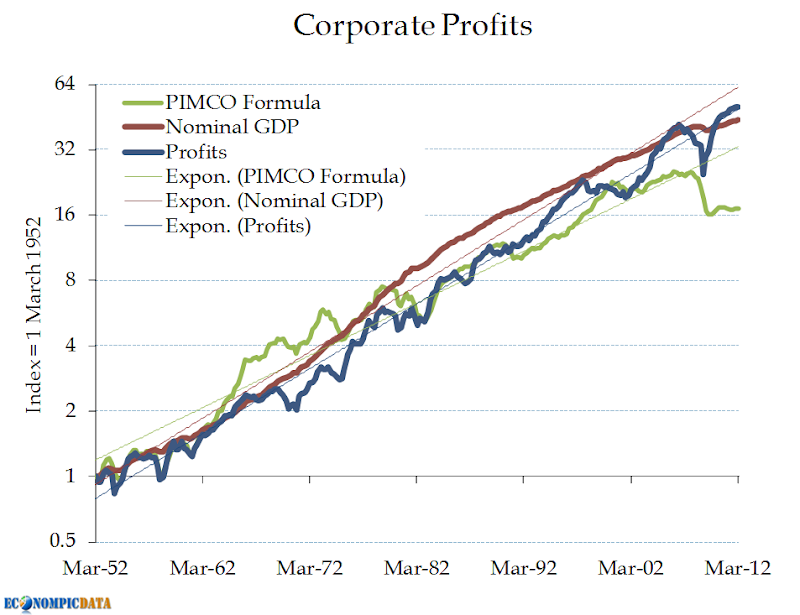 Simple formula: US profit growth rate = (real GDP x 5) – 10. No “ka-ching” at 2% or less GDP growth. I appreciate the insight that profits can be thought of as being leveraged to economic growth (hence the wide fluctuations), but struggling to see why nominal profit growth would have a relationship with a real (after inflation) economic growth or why those specific numbers (why 2% real and not 2.5% real?) were used. Anyhow... I was interested enough to see what this equation looked like using actual data, so I put together the below chart going back 60 years against corporate profits, as well as against my old simple standby of using nominal economic growth (my preferred long-term measure for corporate profits as simple math tells you that corporate profits can't grow faster than the economy over the long term or else they'd be bigger than the economy itself - hence profit growth tends to mean revert relative to nominal growth). 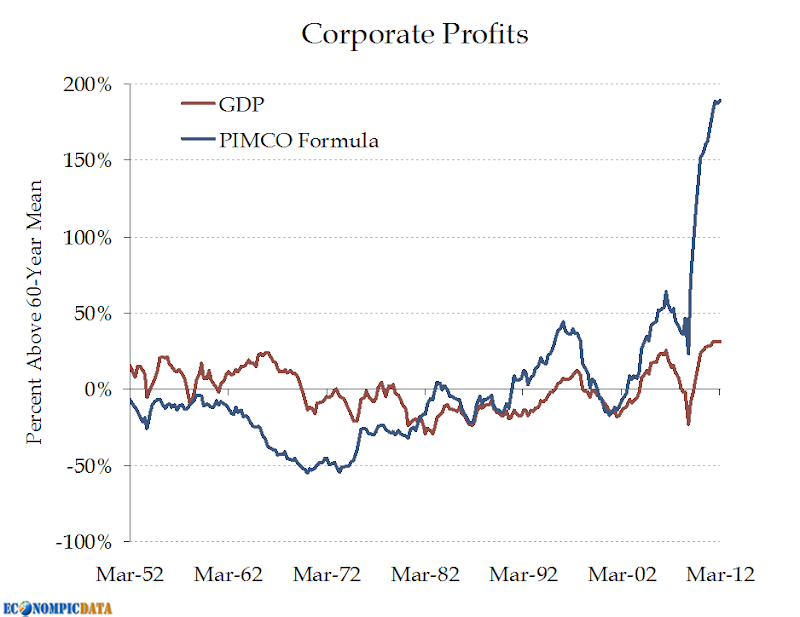 Well corporate profits are basically right on trend (a surprise to me), but nominal growth is well below trend and the PIMCO formula (the formula based on 2% real growth) is WAY below trend, indicating corporate profits are significantly above trend (by that record 30% level relative to nominal growth and an off the charts 200% relative to the PIMCO formula). Seems like the old nominal GDP standby has historically been more reliable, but I will be thinking more about the insight that corporate profits are leveraged to (and in need of) specific levels of economic growth. If anything, this may indicate earnings are potentially more stretched than I previously thought. For those interested, there was a great piece by GMO on the topic of extended profits a few months back. In other words, if someone has a profit then someone has to have an equivalent loss. Whose loss is that? Sorry, but PIMCO boss has no clue about economics. His disastrous bets on Treasury are the best indicator of it. Why would a corporate gain have to be someone's loss? That makes sense with futures trading, but not the "real world"? Example... I product something at a cost of $90 and sell it for $100. Gain of $10. The person buying it values it at $110 and pays that $100. Economic gain for them of $10 as well. I would note he was VERY wrong about the Treasury trade, but that was one position (and he's been around for 40 years). Does that one mistake mean he is disasterous? Have you bothered to look up his broader track record or relying on a headline you read somewhere? You need to think in terms of macro. Macro gives you a closed system. Your example is a micro-example. Where does the second guys has his 100 from? What does it mean it cost 90 to produce? Etc. These are all the critical questions to understand where profits come from. Obviously they do not fall from the moon and they should all be accounting-wise consistent. And you assume a world of zero growth where benefit comes at someone else's expense. What if economic value was created? A growing pie makes it possible to add value and for both sides to benefit. Assume the world didn't even have money, but instead there was only barter. Someone created something tangible out of the earth. Perhaps two knives that were previously pieces of wood and someone else fished something tasty out of the sea (2 fish). They then swap one of each because each valued the others item more than their own. That is a world where there is a net gain and "profit" for each party. "You have two P&L statements: one of your company and the other of the rest of the world". You assume the total "world income" equals zero. Economic growth means the "world income" actually grows. It is not about economic value or assumptions. It is about accounting consistency. Your spending is my income. If I do not spend my income it is called saving. In corporate language it is called profit. My savings accumulate to my wealth. Corporate profits accumulate to equity. If I spend more than my income I need to take debt. But my spending is still someone income and this income is a gain. Simples. "Economic growth means the "world income" actually grows." Check my comment above about debt. Knowing you were of the Austrian point of view, I tried to make an example where there was no actual money involved (money and accounting get in the way of logic in my opinion sometimes). Care to explain why the knife - fish swap didn't result in "profit" for each party? Money in its simplest sense is purely a way to simplify transactions. In my view, both parties profited by more than they would have without the transaction (each now has one knife and one fish, whereas without the transaction they wouldn't have bothered making an extra knife or getting the extra fish) and neither is indebted to the other. Both simply have more... a "profit". Seriously. You keep on talking economic value but corporate profits are not about economic value. They are about accounting value, which is income minus spending. Whether it is fish or bonds or land or air, it does NOT matter. Income minus spending plus net revaluation gains. If real GDP grows (at least we want it to grow) and we generally tend to have inflation rather than deflation then equivalently MV in MV =Py grows as well. MV =Py is not an equation. It is equality. Historically V tends to fall meaning that M has to grow even faster than Py. However M is debt. Household, public, corporate, foreign. Our system is built on debt but it requires debt in order to grow nominally as long as V is falling. Debt is someones spending larger than income. So who is that? Today in the USA and globally in general it is public sector which is running huge accounting losses. 10% of GDP in the US is a lot of money to be made by everybody else including foreigners. about 6% of GDP in Europe. Japan, UK, China and so on. Surely some part of it ends up in corporate profits. But what does it have to do with GDP growth as such and as per PIMCO? Nothing. It is all basic accounting. So what I wrote about is not Austrian, neoliberal, keynesian or whatever. What I wrote is about primary accounting rules. I just want to say that I really do appreciate your comments and I broadly agree (especially your last point, which was the gist of the GMO paper). My last point goes back to your point on debt. At a given point in time, debt may be thought of as simply spending more than you have available. Not an incorrect assessment. What it doesn't account for in that simple equation is that the debt may be used to add productivity (and future economic growth) that will increase future real (not just nominal) growth than otherwise possible. Thanks again for all the points. I do not deny productivity. The problem for profits though is that productivity is just not there. And it is still about economic value. Игры рынка, you are freaking good. do you have your own blog? Would love to read your stuff. But sound like you are a big shot? no?